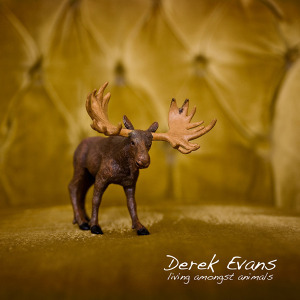 Derek Evans used the PledgeMusic platform and the “Music with a Cause” campaign to “crowd-source” (what they call “audience subsidizing” nowadays) his new album, Love Amongst Animals. Having toured and/or shared stages with Jason Mraz, Everclear, Blues Traveler and many other singer/songwriters, Evans created his album as he always has – as a true, independent musician. The album starts with “Yellow Steps,” a lightly grooving acoustic guitar piece with a deceptively laid-back drum part and a smart, quick lyric. “A River Will Flow” sees Evans leaving lyrical lines to dangle, his rhythm section spot-on and a “tears of joy” section lifting the tune to a poignant edge I wasn’t expecting. “Take Me as I Am (Ballad of Stell Part II)” is another true groove-r, with Evans’ shaky vocals sounding great. A good, light harmony behind him, and organ music wraps this one-up as the most commercial tune of the bunch. “High School Walls” sees Evans in that quick lyric mode like “Yellow Steps.” And though as good a tune as any here, for me it’s the very personal “The Wind Cries” that sees not only some truly inspired acoustic guitar playing, but a great honest vocal and a stellar production. This gem was featured on the iTunes pop and singer-songwriter charts for the entire month of September, and I can see why.